Brooklyn Heights Farm | Small Change: Real Estate Investing. For Everyone. This project offers an 8% annual preferred return paid quarterly PLUS a 4% bonus preferred return when the houses sell. If all goes well investing $1,000 will get you $1,180 back, including your initial investment, in 18 months. The funds raised through this offering will be used to build three for-sale houses on historic farmland, conserved with an easement, in the Hudson River Valley of New York. Sustainable building techniques are planned including a prefab foundation and modular construction along with geothermal heating and cooling. The developers are anticipating construction and sale of all three houses within an 18-month period. Brooklyn Heights Farm is a residential development on a historic farm on Brooklyn Heights Road in Rhinebeck, Dutchess County, in the Hudson River Valley of New York. This Agrihood conservation project on 1860's farm land will be built using modular and prefab construction, focusing on conservation, preservation and green building techniques. The land has already been subdivided into lots in preparation for the homes, with a conservation easement filed with Dutchess Land Conservancy to protect the land in perpetuity. Each lot respects the land characteristics, preserving open spaces, sight lines and natural beauty. In addition to the preservation of land, green building techniques including prefab construction and geothermal heating and cooling will be used. The project is located just a ten-minute drive from an AMTRAK rail station and a twenty minute drive to the northernmost stop on the Metro North rail line from NYC. The houses are planned to surround a common agricultural area that will be promoted for common benefit, such as an Agrihood concept working with local farmers, beekeepers, or others. The developer, S3RD LLC (“S3 Residential Development” or the “Manager”) has formed Brooklyn Heights Farm Residences LLC (the “Company”) to complete the Project. S3 Architecture LLC is providing architectural design services for the Project. The principal of S3 Architecture is also a principal of S3 Residential Development. This close relationship helps to ensure a streamlined design and development process. This offering is to provide the required equity necessary to borrow construction funds and to build the first three houses on the land. The first house to be built, Salisbury House, will be sited at the southernmost end of the property. The three-bedroom/three-bathroom 3,613 square foot house will built at the edge of a densely wooded parcel opening up to three natural ponds and open pastures beyond. Sustainable building techniques are planned including a prefab foundation and modular construction along with geothermal heating and cooling. The house will be oriented to take full advantage of the natural setting with walls of windows opening to a multi-level deck and pool to promote indoor-outdoor living. Other planned features include oak hardwood flooring, open plan living, a kitchen and dining space complete with custom cabinetry, Miele appliances and a wood burning fireplace. A central two-story entry hall will open to a den and guest bathroom and lead to two guest bedrooms, guest bath and a master suite upstairs. Reed House, the second and smallest of the three houses, will be located centrally amongst trees and open spaces and with a natural pond view. This three-bedroom, two and a half bathroom house is planned is envisioned as an open plan, single level house of 3,000 square feet and with warm modern finishes. Barn Estate, the third house, is planned for a larger, pastoral lot which has both mountain views and plenty of room for private and agricultural uses. This 3,500 square foot house is expected to have similar spaces to Salisbury House including three bedrooms, three bathrooms, a den, second floor deck and attached garage. Other planned features include a recycled, engineered timber frame and green roof for sustainability, a generous double height open plan, a kitchen with custom cabinetry, a living space with a fireplace and views out past the pool to the pasture and Catskill Mountains beyond. The expected Project timeline is 18 months from construction start through marketing and sales. The time frame from start to finish is shortened by the close relationship between S3 Architecture and S3 Residential Development, and by the use of modular construction. The Company anticipates six months to complete the design and construction process for each house and another six months for marketing and sales. The construction start of each house will be staggered by three months. See Exhibit A: Project Numbers which includes a detailed construction timeline. The design and material specifications for the first house, Salisbury House, are already complete, budgeting has been finalized and bank financing is underway. Permits are in place for pre-construction preparations including laying the driveway and clearing the land. For more detail, download the full set of architectural drawings. Houses two and three are in the architectural design phase with initial town approvals in place. S3 Residential Development (the “Manager”) is owned and operated by Doug Maxwell and Christopher Dierig. Doug and Christopher bring a significant depth of experience to the Project, having built projects together in Brooklyn, New York and Kentucky, focusing on value-add renovation and conversions. The team leverages long-time established relationships with construction, management, expediting, interior design and brokerage partners. The firm designs in the New York urban and ex-urban context. These projects can be found in neighborhoods where departed industries present opportunity to salvage urban relics and imagine new occupancies. ​S3RD’s sustainable design approach utilizes green, renewable materials and energy-efficient systems in construction, thereby doing its part in preserving the environment. Christopher Dierig is also the principal of S3 Architecture, which he founded in 2005. S3 Architecture stands for the “Studio for Sustainable Shelter,” and is an architecture, interior and urban design studio based in New York City. Christopher is a Registered Architect in New York State, and a member of the US Green Building Council. He has designed new buildings, interior renovations, historic building conversions and urban designs for residential, commercial, educational, retail, hospitality, and entertainment projects, both big and small. Notable projects include the Billiard Factory Lofts, Bleeker St. Townhouse, the Brooklyn Zinc and Bedford Cheese Shop. Christopher holds a master's degree in Architecture and Urban Design from Columbia University, and a bachelor's degree in architecture from the University of Kentucky. As part of his undergraduate studies, he studied architecture in Venice, Italy at Atelier Archittetura Veneziano. Prior to launching S3 Architecture, Christopher worked in award-winning German, New York and Midwestern American architecture firms including D-ash Design, Fitzsimons Office of Architecture, Omni Architects and Architecture Büro Volf. Doug Maxwell leads business management for S3 Residential Development. Doug is a successful entrepreneur having launched and managed businesses in both creative and technical genres. His background provides a blend of business, design and technology focus to the firm. Previously, Doug founded Insala, which provides web-based talent development software to companies, and which now serves Fortune 1000 and 100 multinational corporations from offices in New York, London and Dallas. Doug continues to serve as CTO for Insala. Doug's entrepreneurial passion remains evident in his application of cross-functional skills to all of his entrepreneurial ventures. Through his interest in architecture and design, Doug leads S3 Residential Development business operations, financial oversight, research and partner relations. The project is located in the town of Rhinebeck in the Hudson River Valley of New York. The rural lifestyle, prime local produce, picturesque landscape, Catskill Mountains, restaurants and proximity to New York City and nearby hiking and skiing attractions combine to attract buyers from New York City. 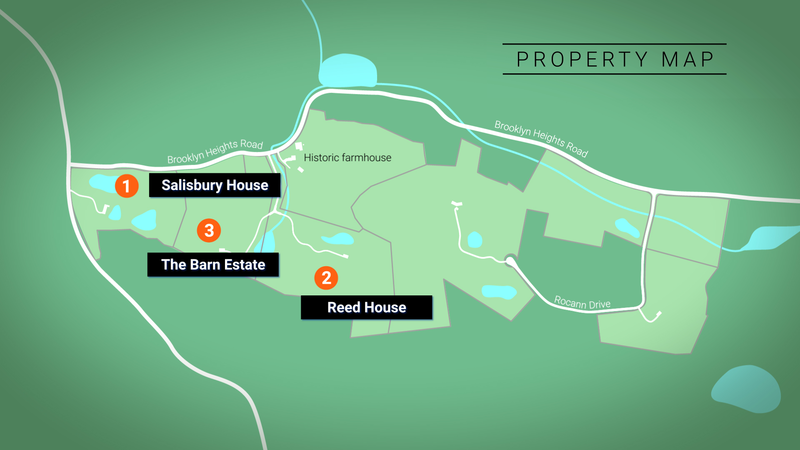 The Project’s property with its rolling hills and multiple ponds is located just 5 miles from the quaint village of Rhinebeck - an attraction across the Hudson Valley. Weekenders enjoy the foodie restaurants in Rhinebeck and surrounding villages in part because the Culinary Institute of America is based in Dutchess County. The Hudson Valley area’s houses and estates are home to many wealthy and famous. Given the rural nature of the area, there is very limited housing stock for would-be buyers. Properties tend to be either lower end or large estates, leaving little opportunity for the middle-income buyer. There are very few contemporary properties available in the area, and as a result modern development with contemporary design aesthetics has had success in surrounding areas, such as the Hudson Woods development in the Catskill Mountain area and nearby Milan Case Study. The Project responds to this lack of inventory with parcels large enough to provide the buffer and privacy buyers want, proximity to great restaurants and culture, modern homes and rustic touches at a size and price point more affordable than the grand estates that are simply too large to appeal to most buyers. You can download a more detailed comparison to other nearby properties here. Total acquisition and development costs of approximately $4.155 million will be financed with an acquisition loan of approximately $229,472, construction financing of approximately $3.2 million, Sponsor equity of $172,916 and the equity raised through this offering. The Company expects to build and sell the 3 houses within an 18-month period at which time all loans and equity will be repaid. You can download a detailed project budget, including a construction schedule, here. We plan to use the proceeds of the two offerings with a maximum goal of $550,000, together with Sponsor equity and a bank construction loan, to design, build and sell a series of homes to be built on land subdivided with a conservation easement. In an offering under Reg CF the issuer is required to state a “Target Amount,” meaning the minimum amount the issuer will raise in the Reg CF offering to complete the offering. For the reason just described, our Target Amount for the Reg CF Offering is $1,000. It doesn’t matter how much is raised in the Reg CF Offering and how much is raised in the Reg D Offering. Thus, if we raise $1,000 in the Reg CF Offering and at least $99,000 in the Reg D Offering we will proceed, and vice versa. However, we will not complete the Reg CF Offering OR the Reg D offering unless we have raised a total of at least $100,000 (minimum goal) by May 7, 2019. If we haven’t, both offerings and all investment commitments will be cancelled, and all committed funds will be returned. The minimum investment in the Reg CF offering is $1,000, and the minimum investment in the Reg D offering is $5,000. Investments above the minimum amount in either offering may be made in $1,000 increments (e.g., $2,000 or $6,000, but not $5,136). Investors can cancel their commitment up until 11:59 pm on May 7, 2019, EST. After that, any funds raised will be released to the Company and Investors will become Investor Members of the Company. The Company may decide to change the Offering Deadline but will provide at least five days’ notice of such a change to all Investors. Investors will also be notified and asked to reconfirm their commitment if any other material changes are made to this offering. The full disclosure documents, which include Form C can be downloaded here and viewed on the Securities and Exchange Commission’s website here. Desirable. Country lifestyle located within 2 hours from New York City. Scenic. Large parcels of scenic land including woodlands, pastures, natural water features and mountain views. Conservation. Conservation and sustainability focused development preserving the natural land characteristics and open views. Modern. Houses designed with modernist design aesthetics. Preferred returns. Return paid quarterly throughout project timeline with an additional accrued return at project end. Experience. Development team has a proven history in New York development projects. a. First, the Available Cash shall be distributed to the Investor Members until they have received their Preferred Return for each quarter. b. Second, the balance of the Available Cash, if any, shall be distributed to the Investor Members until they have received any shortfall in the Preferred Return for any prior quarter. c. Third, the balance of the Available Cash, if any, shall be distributed to the Investor Members until they have received a full return of their Unreturned Investment. d. Fourth, the balance of the Available Cash, if any, shall be distributed to the Investor Members until they have received an additional 4% Annual Return on their investment accrued over the lifetime of their investment. Each Investor will receive an 8% preferred annual return on their investment, paid quarterly over the Project’s life-time, in addition to another 4% annual return accrued and paid when the project is complete. While the estimated Project timeline is 18 months, it may take less or more time to complete. Investors will receive their preferred and accrued return from the date the funds are invested until the houses are sold and equity is repaid. If, for example funds are repaid after 14 months, the Investor will receive a preferred return of 8% plus an accrued return of 4% for the 14-month period only, after all loans and other expenses are paid. Doug and Christopher plan to purchase one of the homes at project completion, leaving only two for sale on the open market. A crowdfunding investment involves risk. You should not invest any funds in this offering unless you can afford to lose your entire investment. In making an investment decision, Investors must rely on their own examination of the Companies and the terms of this offering, including the merits and risks involved. These securities have not been recommended or approved by any federal or state securities commission or regulatory authority. Furthermore, these authorities have not passed upon the accuracy or adequacy of this document. The U.S. Securities and Exchange Commission does not pass upon the merits of any securities offered or the terms of this offering, nor does it pass upon the accuracy or completeness of any offering document or literature related to this offering. These securities are offered under an exemption from registration; however, the U.S. Securities and Exchange Commission has not made an independent determination that these securities are exempt from registration. There are numerous risks to consider when making an investment such as this one and financial projections are just that - projections. Returns are not guaranteed. Conditions that may affect your investment include unforeseen construction costs, changes in market conditions, and potential disasters that are not covered by insurance. You can download a more expansive list of potential risks here. Unless otherwise noted, the videos and images on this page are used to convey the personality of the neighborhood in which the Project is planned. Properties shown in these images are not included in this offering and Investors will not receive an interest in any of them.